A second round of protests is scheduled at LA Unified schools today as the district and its teachers union, UTLA, continue to lock horns over teacher pay raises, among other issues. “We had full participation at several hundred schools for the first one, and we expect the same today,” UTLA spokeswoman Suzanne Spurgeon told LA School Report. Mediation efforts yesterday failed to produce an accord although an agreement to accelerate talks by scheduling meetings for Thursday and Friday appeared as a sign of progress. The union called the protests as part of its “Schools LA Students Deserve” campaign; Spurgeon said boycotts of faculty meetings and protests will be held at all LAUSD schools today after classes end. UTLA president Alex-Caputo-Pearl didn’t return calls seeking comment, and Spurgeon referred to a March 24 statement released at the time of the first boycott and protest. 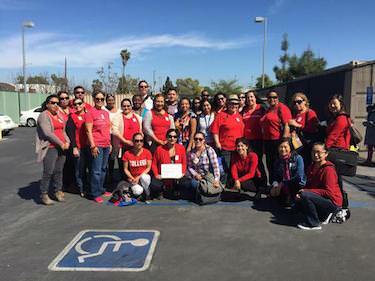 “We know the District has money available for new contract proposals that would move us closer to a fair bargaining agreement that is good for students and good for educators,” UTLA officials said in the statement. The teachers union is demanding an 8.5 percent pay raise, which would be the first in seven years; reduced class sizes and hiring more staff, including counselors, nurses and librarians. The district has countered with a 5 percent raise offer. The district says meeting the union’s demand would cost the district $800 million, an amount that would either bankrupt the district or cause layoffs and elimination of programs to compensate.